Nick's Quick Column: "The Bears Have No Sense of Direction." 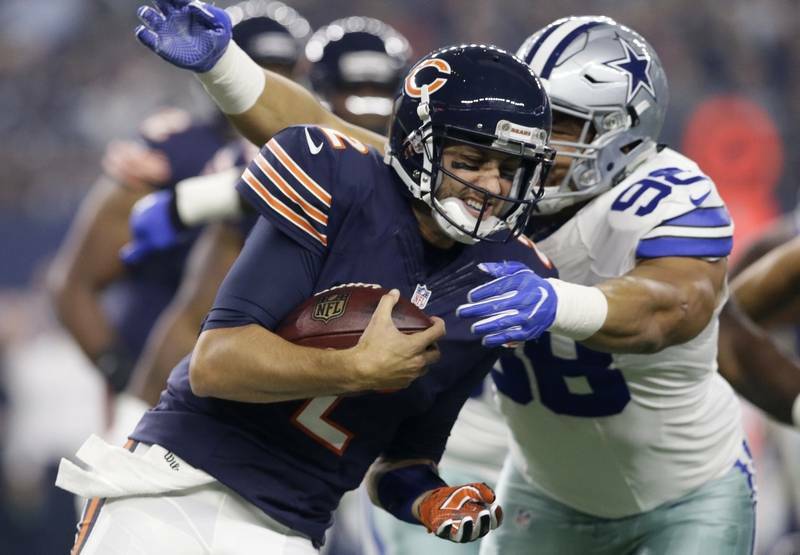 The Bears were in the spotlight once again for all to see on Sunday night, but the light was shining brightest on the Cowboys rookies who sent the Bears packing home in the dark with a 31-17 loss at AT&T Stadium. The Bears have no sense of direction, the offense has no identity, the defense is filled with holes due to injury, and most disappointingly, there is no light at the end of the tunnel. Offensive coordinator Dowell Loggains still has yet to call a complete game. With the offense only generating three points in the first half against the Cowboys, a moral victory is seeing the offense score their first points in the second half, with a pair of touchdowns from Zach Miller. But, that doesn’t mean a thing when the end result is still a zero in the win column for the Bears. Still, the winless Bears have not shown a balanced attack in the run game or the pass. Loggains has fans scratching their heads as he calls plays that are designed to go for six yards when the team is constantly facing third and ten, resulting in a Pat O’Donnell punt, a majority of the time. Defensively the Bears don’t have enough depth to replace the key starters that are missing due to injury. Without Eddie Goldman and Danny Trevathan anchoring the middle of the Bears defense, the Cowboys rookie running back Ezekiel Elliott was able to choose whichever gap he wanted and exploit the defense for big gains. With no type of pass rush from the Bears front seven, it was an easy day for the rookie quarterback, Dak Prescott who went 19 of 24 for 248 yards and had a 123.6 passer rating. Prescott also threw his first touchdown of his young career. In John Fox’s second year as head coach, the Bears start the season 0-3 yet again. Losing to the Packers, Cardinals and Seahawks in 2015 and the Texans, Eagles and Cowboys this season. Supposedly, Fox has an act for turning a program around in his second year, but at this rate, the only thing Bears fans will look forward to is what pick they will have in the 2017 draft. Fox got his first and only win at Soldier Field last season in Week 4, maybe the Bears will do the same next week against the 1-2, Lions.